Will Friday night's storms impact the Easter Weekend? "It's been very busy. People are buying locally, which is great," said Anthony DiMeo III, seen with Nancy Tratta, at DiMeo Farms Market and Garden in Hammonton. "It's a good thing for everyone in the community to keep the spending locally." Angelo's Farm Market in Mullica Township has been open since March 15, and customers have been coming in to purchase annuals and perennials, vegetable plants, hanging flower baskets and shrubs, owner Lucie Fichetola said. Spring is unfolding, and that means farm markets, roadside stands and nurseries are open for business and ready to serve the public's desire for gardening - and good eating. Angelo's Farm Market in Mullica Township has been open since March 15, and customers have been coming in to purchase annuals and perennials, vegetable plants, hanging flower baskets and shrubs, owner Lucie Fichetola said. The second-generation family farm market has been around for 66 years, Fichetola said, and many people are repeat customers because of the personal attention and advice they get. Business has been going well so far, Fichetola said, but recent high winds, frost and rain were a slight setback and some plants were damaged. Fichetola said the farm stand business is more weather-driven and the declines are more related to poor weather rather than the economy. Ron Fisher, owner of Ron's Gardens and Square Deal Market in Hammonton, said his business has been open since March 10 and it is offering New Jersey asparagus and strawberries, with more fruits and vegetables to come later in the season. The market also offers annual and perennial plants, along with a large variety of tomato, pepper, eggplant and melon plants. Fisher said the recent cold snap and frost "nipped" some of his plants. However, the weather overall has been better for drawing customers, compared with record-setting rains New Jersey experienced last year, he noted. "It's good, better than last year because it's all weather," he said. "The weekend weather's been nicer and people come out." New Jersey-grown strawberries are available at Red Barn Farm Market in Hammonton, and owner Evelyn Penza, who also runs a pie shop, has been busy making strawberry shortcake, strawberry and rhubarb pies and strawberry peach pies. Penza said asparagus will be on the way soon and she will sell other locally grown produce on a limited basis. The market's primary offerings include flowers, perennials and plant baskets. Penza said business has been fine so far, except high winds deterred some customers and the cold snap hurt the flowers. It is still too early to harvest berries, but DiMeo Farms has been selling grow-your-own blueberry, raspberry, aronia black chokeberry and teaberry plants. 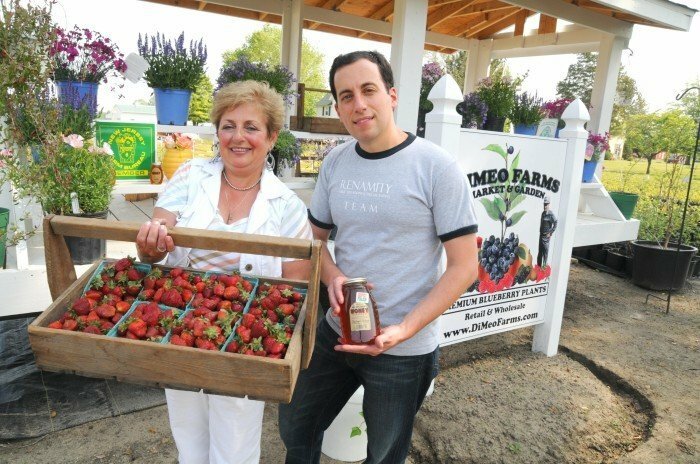 Owner Anthony DiMeo III said the fourth-generation Hammonton farm opened for the season in April, and he has seen a lot of traffic from people who are interested in these high antioxidant fruits, as well as purchasing honey and antique fruit and vegetable crates. "It's been very busy. People are buying locally, which is great," DiMeo said. "It's a good thing for everyone in the community to keep the spending locally." Rainbow Farms, 345 N. Genoa Ave., 609-457-4692. Available: annuals, perennials, bedding plants. Glossy Fruit Farms Market, Route 206 and Myrtle Street, 609-561-9556. Available: seasonal fruits, annuals, perennials, garden mums, herbs. Pastore Orchards, 626 S. Whitehorse Pike, 609-561-8464. Available: seasonal fruits and vegetables. Red Barn Farm Market and Penza's Pies, 51 Myrtle St., 609-567-3412. Available: pies, seasonal fruits and vegetables, annuals, perennials, shrubs and trees. Ron's Gardens and Square Deal Market, 276 N. White Horse Pike, 609-561-5516. Available: seasonal New Jersey produce, annuals, perennials, shrubs and trees. Rosedale Nursery, 733 Egg Harbor Road, 609-561-9500. Available: perennials, trees and shrubs. Angelo's Farm Market, 5600 White Horse Pike, 609-965-0919. Available: annuals, perennials, season fresh fruits and vegetables, trees, shrubs. Butterhof's Shady Brook Farm, 5800 White Horse Pike., 609- 965-1285, www.shadybrookfarmnj.com. Available: fresh fruits and vegetables in season, open July to October.